Our injector unit ST-160 in its sturdy stainless steel box is perfectly suitable for the truck and car wash sector. The lockable cover protects the metering valve for cleaning agents from unauthorised adjustment. By releasing only one screw at the base plate, the injector can be removed or replaced easily. To this end, the cover has to be opened. For wall mounting purposes, two fastening holes of 9 mm are provided at the back of stainless steel box at a distance of 240 mm. This sophisticated solution is also suitable for the food industry. 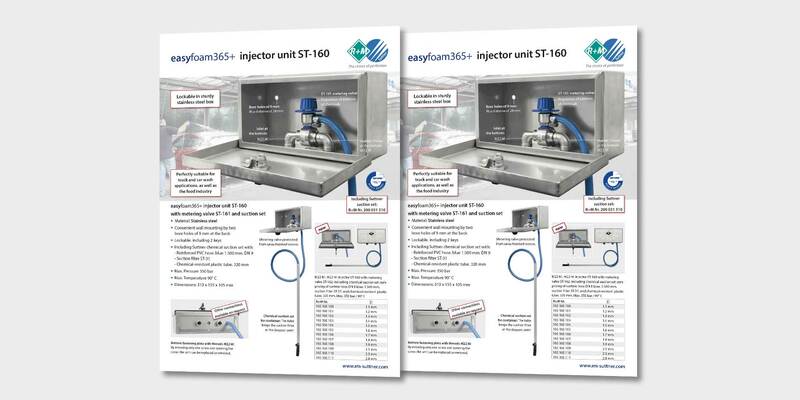 For detailed information about the easywash365+ injector unit ST-160, please refer to our datasheet.